How to Successfully Play QCP Files anywhere? The QCP file format is used by many cellular telephone manufacturers to provide ring tones and record voice. However, this Qualcom PureVoice (specifically a LG or Motorola recorded QCP file or QCP with EVRC codec or QCP with 4GV codec or QCP with TIA IS-127 Enhanced Variable Rate Codec, Speech Service Option 3 ) is not compatible with most media player and not supported by Windows and Mac. It will end in fail if you try to play the recorded QCP file with Windows Media Player, iTunes, QuickTime on Windows or Mac computer. In order to successfully play QCP files anywhere, converting QCP to MP3/WAV/WMA will be a recommended solution. Bigasoft Audio Converter is just the right QCP Converter software which can fast convert QCP to MP3, WAV, WMA, M4A, AAC, AC3, OGG, AIFF, ALAC, FLAC and etc. in addition to converting QCP to WAV/MP3/WMA, this powerful QCP Audio Converter also helps to convert other audio including FLAC, OGG, APE, CUE, AIFF, CUD, CAF to MP3/WAV/WMA. It even converts various video formats including AVI, WMV, MP4, MKV, FLV, MOV, and etc to audio format like MP3. 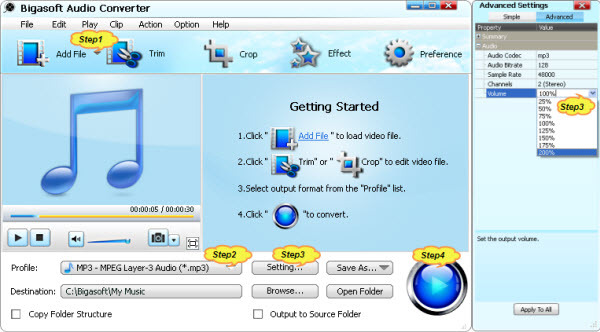 The following will introduce a step by step guide on how to convert QCP to MP3 with the help of the powerful QCP Converter - Bigasoft Audio Converter. Besides act as a QCP to MP3 Converter, it also acts as QCP to WAV Converter, QCP to WMA Converter, QCP to M4A Converter, QCP to AIFF Converter and etc. With Bigasoft Audio Converter, QCP file with EVRC codecor/TIA IS-127 Enhanced Variable Rate Codec, Speech Service Option 3 is also not a problem. 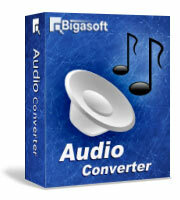 Free download the powerful QCP Converter - Bigasoft Audio Converter (Windows Version, Mac Version), install and run it. Firstly copy the QCP file to computer, and then click the "Add File" button of this QCP to MP3 Converter to import the QCP audio file. Or you can also drag the QCP file directly to the main interface of this software. Usually, the default output format is just MP3 format. If you want to convert QCP to MP3, just ignore this step. If you try to convert QCP to WAV, WMA, M4A, AIFF, AAC or any other audio format, click the "Profile" drop-down button to select your desired audio format from the "General Audio" category. Click "Setting..." button, the "Advanced Settings" Window will pop up right beside the main window. In the "Advanced Settings" Window, click "Advanced" tab, and then go to "Audio" column, click 100% tab on the right side of volume to select preferable volume ratio from the drop-down list or just enter the desired volume ratio like 300%, 400%. Click "Convert" button to start the QCP conversion. It will be finished with high output quality and fast converting speed. It is just easy to convert QCP (including QCP with EVRC codec/QCP file with EVRC codecor/QCP with 4GV (Qualcomm's Fourth Generation Vocoder (4G) )codec/TIA IS-127 Enhanced Variable Rate Codec, Speech Service Option 3 ) to WMA, MP3, WAV, AIFF, M4A, or AAC with the above step by step guide and the powerful QCP Converter. Wait no more, just free download this QCP file Converter to successfully convert and play QCP anywhere.